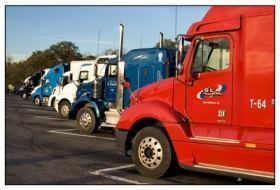 Ok, here I go again….giving my thoughts, opinions & ideas regarding truck stop services (i.e. Pilots & Flying J's). Earl and I stopped at a Pilot in Ontario, Oregon (which we stop at quite frequently) on our trip down to Texas to deliver a load and on this one particular day we had money in the bank which is very unusual for us (LOL). We discussed getting hooked up to the internet while on the road and thought that we would get connected with Pilot. Whatever! Needless to say the clerk I spoke to there (who shall remain nameless) had no clue whatsoever about "wondering wifi" they advertise for their company so she had me speak with the manager and guess what? He directed me to the advertisement on the poster taped to the door and instructed me to call the phone number listed on the piece of paper. Now, for me, I'm thinking' that the company should actually have someone on staff that knows about the products that they sell or advertise. For example, it would be like me owning a company that sells farm equipment and I know nothing about em! Pretty dumb huh? One thing that I believe, only due to experience, is that when I work for a company I like to be informed as much as possible regarding the products I'm selling for my employer, which in turn means, in my opinion, they (Pilot Truck Stop) should have at least one, maybe two people staffed for just that purpose - to be able to help get customers connected that don't have the information or knowledge to do it themselves. And I certainly haven't been the only one with this problem. I know of a few people that have been in this situation. I tried calling the phone number that was posted on the advertisement and the salesperson that I reached didn't know about the product he was selling either. He told me that I needed to be connected to the internet to be able to use the "wifi" they were selling so that I could get my code to get connected. Duh! My question to him was, "How do I get connected with them when I don't have internet yet so that I could use their services?" and his answer to me was, "I don't know." Guess he was just there for a paycheck - commission or not. So what Earl & I did at that point was go to the Flying J at our next stopping point and the ladies that were working there were very helpful. They told me everything that I needed to know regarding the internet out on the road, as well as where and how I needed to get connected. That was an accomplishment - and it was great having the internet on the road. Thank you to those ladies at the counter, and my apologies for not getting your names to have you recognized for your help. The trucking company that Earl works for doesn't do fuel business with Flying J's but it doesn't take much to find one, sit down have a meal, or just something to drink so I can stay connected with y'all out there in the real world. I've been to quite a few places now while on the road, and I've discovered that most of the employees at the TA's and the Flying J's are the most personable. They are courteous, helpful, and very nice. Most of the Pilot personnel could use some instructions and guidance on service and communication with the public. Seems to me that they could care less about giving someone the time of day, let alone any other information necessary for daily productivity, and believe me I'm not one for holding my tongue when it comes to giving my opinions about any situation at hand. They don't pay my bills and they aren't gonna lie in my casket when I die, so I don't care what they think of me or anyone else for that matter. When it comes to a trucker having to ask for help, I know that it's hard sometimes due to the "ego" thing, but when they do need the help it would be great if the person they're asking had the knowledge to actually help them out. I know that y'all can relate to this. Its frustrating being in unknown territory, seemingly lost in whatever situation you're in, and not having the proper information to get you through it. And "frustration" is an understatement. It tends to piss me off when I have to talk to "stupid people" - "Here's your sign!" I'm not the "sharpest knife in the drawer" or the "brightest color in the box" but at least I don't have to wear a sign (LOL). Thank goodness there's always room for improvement and for me, it's all lessons well learned. So with that, y'all take care and stay safe. More opinionated B.S. coming later.